Heroes represent those who display bravery, courage, and self-sacrifice for the greater good. They possess the highest character, ideals, and values. They may not have started out heroes, but along their way, through hardship, trials, conscience, or circumstances, they were changed for the better. We hope that you will enjoy the following books as much as we do. "This morning Willy woke up with a plan. 'Come on, Bobo, today we're going exploring.'" With an exceptional imagination, Willy explores the forest with Bobo, his trusted sock monkey, and Earl, his pet cat. They find poison mushrooms, nuts with hats, flowers, a friendly caterpillar, an explorer stick, an abandoned comb, and a red bucket, which Willy uses to launch Bobo into the river. While Bobo floats away, Willy returns home for the proper rescue gear (fishing line and rain gear), but a certain cat delicately steps across rocks to rescue the sailor man, only to receive an accidental drenching for his effort. Heroism comes in all shapes and sizes, but it is delightful when unexpected. 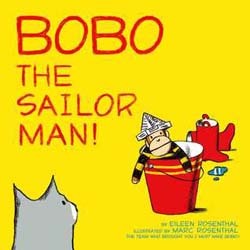 With humor, exuberance, and curiosity, this follow-up to I Must Have Bobo! (2011) and I'll Save You Bobo! 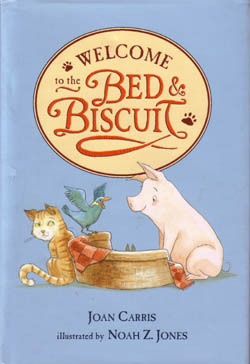 (2012) will captivate small listeners and is a great choice for storytime. 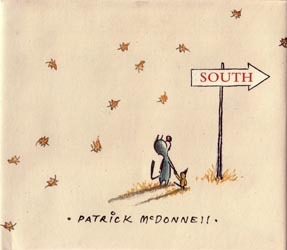 As a yellow flock of birds takes flight from a tree, a lone leaf flitters down and wakes a sleeping bird on the ground. Realizing that his flock has flown south for the winter, he begins to cry. Mooch happens along and takes compassion on him. Together, paw and wing, they begin a journey down streets, through crowded cities, across fields, and past forests, until they hear twittering from a utility wire. With a thank you and hug, the little lost bird joins his flock. This wordless story of compassion and friendship will tug at hearts for sure. 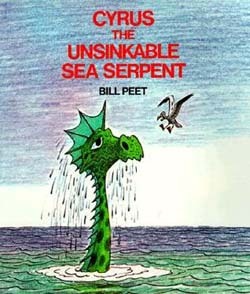 "Once upon a time there was a giant sea serpent named Cyrus. Even though he was a horrible looking monster he wasn't the least bit fierce." When called a sissy, he decides to prove his bravery by sinking a ship. Cyrus reconsiders his decision when the Primrose encounters the doldrums, storms, and is attacked by pirates. Blowing the ship across quiet seas, using his body as a flotation devise during storms, ramming the pirate ship, and pulling the damaged Primrose to safety, Cyrus becomes a mighty hero. Children and adults will enjoy the marvelous message of courage, self-sacrifice, and protecting life. 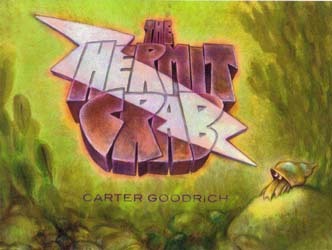 "The hermit crab in this story didn't set out to be a hero. And he wasn't particularly brave. He was actually very shy." While searching for food one day, he discovers a new home and takes up residence in the top half of an action figure toy. When a wooden chute falls near the town square and lands on a flounder, the hungry crab investigates the delicious smelling trap, inadvertently frees the flounder, and becomes the town hero. Not ready for fame, the shy crab abandons the toy and returns to his original shell. The action figure is cheered as the hero, while the little crab, "smiled to himself, and he even cheered the fancy new shell. But he cheered very softly. And just a little bit. He didn't want to be noticed." True heroes come in many shapes and sizes, but they have one thing in common—modesty and bravery in spite of danger. A small boy with an extraordinary talent finds a crayon under the sofa, and he begins to draw in the bathroom, bathtub, at bedtime with a flashlight, the zoo, aquarium, and museum. When Grandma's drawing of a bird comes off the page and settles on her shoulder, everyone is amazed. Mom gets a cat, Dad enjoys a comfy chair, and even the President asks for Andrew's help. "Andrew agreed to try. He drew a picture of some trucks filled with food for hungry people … and one of a big ship loaded with supplies for people whose homes had been washed away by a flood." He sends schools and hospitals to needed places, and boats full of supplies to flood victims. Using his last piece of paper and bit of crayon, Andrew draws something special for himself. 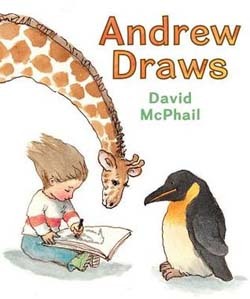 With humor and the message of imagination and caring, children might wonder about the possibilities, if they had Andrew's talent. 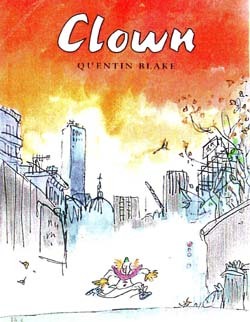 In a wordless picture book Quentin Blake presents an eloquent story of a small rag doll and his friends that have been thrown into the trash. Clown escapes the trash bin, dusts himself off, and searches for help to rescue his discarded friends. The search has it ups and downs, but eventually he finds a young girl and her family, who are in need of a little love themselves. Themes of friendship, compassion, loyalty, and appreciation make this book a unique read-aloud for the young and young at heart. Catkin, a tiny and magical golden kitten is given the job of protecting little Carrie, the only daughter of a farmer and his wife. Distracted by a butterfly, Catkin unknowingly allows Carrie to be captured by the Little People. 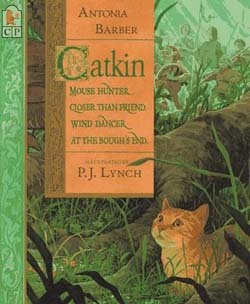 To rescue the child, Catkin ventures into an enchanted land where he must solve three riddles to free her from the Lord and Lady of the Little People. With courage and compromise, the child is returned, and two families learn the meaning of sharing. On the coast of New Zealand, a young girl lives with her annoying little brother, Robbie, a busy mother, and a lighthouse keeper father,. On the eve of her 10th birthday, Annie visits her friends in the garden, a row of hedges. They have names, personalities, the ability to communicate, and are caretakers of a fantail's nest. When an earthquake and destructive windstorm disrupts Annie's yard, the nest blows away, and the hedges are devastated. Claiming that they "haven't lost a bird yet," Mr. and Mrs. Hedge uproot themselves and walk off in search of the nest. 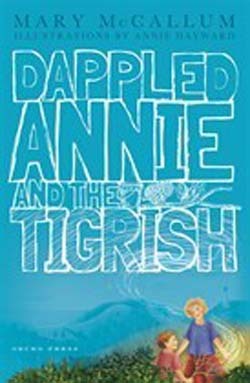 Annie, Robbie, and the magical Tigrish join the hunt through an unfriendly forest to a beach where the nest resides high up on her father's lighthouse. Along the way, Annie discovers unknown bravery, good decision-making skills, and the importance of protecting family and friends. "Protecting someone was a different job from making sure they were okay … It meant you had to be bigger than yourself, not physically bigger exactly, but big inside your head." This delightful story of family, bravery, and a touch of magic will charm all who believe in magic and miracles. To escape terrifying mousetraps in his German homeland, a heroic mouse invents a way to cross the Atlantic to freedom in America. 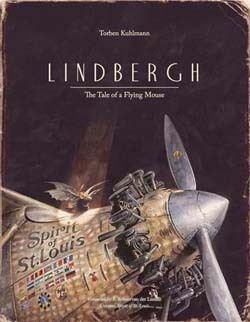 Inspired by his bat-flying cousins, Lindbergh uses intelligence, perseverance, and strength to build a mouse-size plane, narrowly avoiding close encounters with owls and cats. With map in paw and goggles in place, he begins the trans-Atlantic flight. "Night fell, and the air grew cold. The mouse chewed on a hunk of cheese and tried to ignore his exhaustion while swishing through the dark." Arriving safely in New York City, he soon becomes famous. Newspapers tell of his spectacular adventure, and legend states that he inspired a young Charles Lindbergh. Endpapers include A Short History of Aviation, information on Otto Lilienthal, a German aviation pioneer, the Wright Brothers, and Charles Lindbergh. The illustrations are so plentiful and stunning that this wonderful tale might also qualify as a wordless book. Grandpa Bender, veterinarian and owner of a boarding kennel, loves animals. Besides the guests, there are special family animals: Gabby, the mynah bird who cleverly communicates to the outside world through bird chatter, mini-pig Ernest who holds the family together with love and compassion, and Milly, the sensitive and insecure young cat who is the youngest of the family. When Grandpa brings home a hurt puppy orphaned from a fire, the animals are surprised, but it's Milly who develops a case of jealousy and vanishes. It's up to Ernest to find his friend, mend hurt feelings, calm ruffled feathers, and reunite a family with quite different personalities. This is a sweet chapter book full of gentle humor, faithful friends, and a bit of mystery. Twelve-year-old Maximilian Starling finds himself abandoned by his theatrical parents when they sail to India and accidentally (?) leave him behind at the dock. Perplexed and hurt, Max is determined to solve their disappearance and live independently of his grandmother. 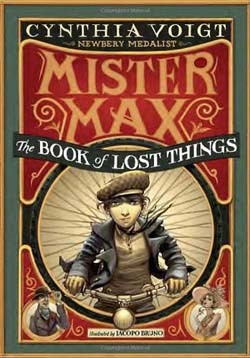 Realizing a need for employment, Max stumbles into detective work and becomes a finder of lost things. Wearing costumes for each job, he discovers an aptitude for finding runaway children, lost dogs, valuable antiques, and reuniting lost lovers. Using common sense, ingenuity, and limited acting abilities, Max evolves into more than a detective. He becomes a "solutioneer," because solutions are needed after retrieving that which is lost. By the conclusion, Max is still unable to solve his parent's disappearance, but the stage is set for a new mystery to be continued in the next installment of a planned trilogy. 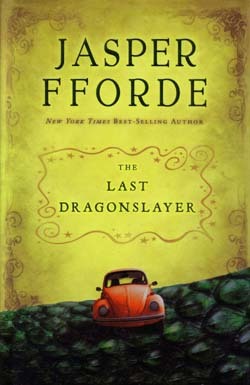 A clever plot, an engaging hero, and colorful characters make this a great read and read aloud. An embittered and troubled eleven-year-old encounters a reclusive neighbor, who changes his circumstances, alters his future, and saves his family and town at Christmas. With a history of larceny, Sam is well known by the police and in danger of being removed from his struggling single dad's care. 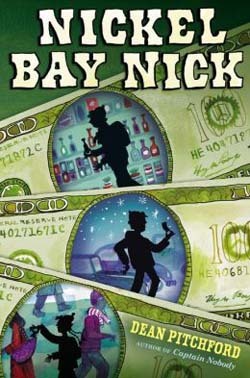 Fleeing from the police one evening, he encounters the mysterious Mr. Wells, a reclusive, wealthy neighbor, who anonymously distributes $100 bills at Christmas to Nickel Bay residents, thereby raising their spirits and the town's economy. Unable to participate this year due to a broken leg, Mr. Wells obtains a list of Sam's crimes, blackmails him into becoming the secret Santa, and trains him in skills of a spy, pickpocket, and cat burglar. What results is a well-written, humorous, exciting, and fast-paced tale of rescue, redemption, and second chances. A surprise ending reveals Mr. Wells' motives for becoming involved in Sam's life. Kids will find themselves rooting for this kid every step of the way. 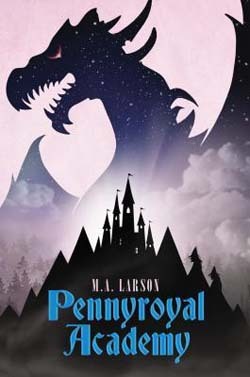 The Pennyroyal Academy exists to train and equip princesses and knights to battle witches and dragons for a coming world war. This year the Academy opens its doors to commoners, and a teenage girl arrives with no name, no memory of her human parentage, and clad in only spider webs. She brings with her Prince Remington, who she rescued from a witch's cage along the way. Given the name Cadet Eleven (Evie), she endures harsh training, jealous rivalries, and impossible tests. Raised by dragons, Evie discovers her strange human family, unexpected friendships, and a Frog Prince. Along with the remaining first year students, Evie learns courage, kindness, compassion, and discipline, the four requirements to fight evil. When discouragement begins to overwhelm Evie, her teacher, Rumpleshirtsleeves, gives wise counsel: "You are not a victim in this world unless you choose to be. And if that's your choice, then you'll never be more than a frightened girl lost in the woods." Readers will look forward to Evie's second year at the Pennyroyal Academy with friends, enemies, witches, dragons, and a bit of romance. Sixteen-year-old Jennifer Strange, foundling from the Blessed Ladies of the Lobster, runs Kazam Mystical Arts Management, an employment agency for magicians. With magic slowly drying up, Jennifer hires out once powerful sorcerers and wizards to magically repair plumbing and electrical systems, deliver pizza, and perform various low level spells around the town of Herford of the UnUnited Kingdom. When magicians begin predicting the death of the last dragon, Jennifer is appointed to kill him. Her negotiating skills are tested as she wrestles with duty, political maneuvering, corruption, and greed. Hilarious characters, unpredictable magic, a Transient Moose, and a Quarkbeast round out this wacky and imaginative tale. This retelling of the Hades and Persephone mythological tale finds two teenagers wrestling with family issues, destinies, and a growing attraction to each other. 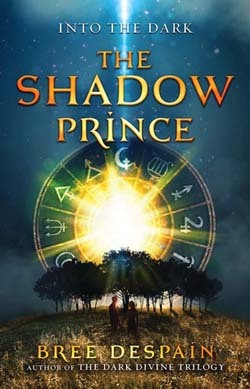 Haden, a disgraced prince of the Underworld, is chosen to travel to the human world to lure Daphne, a strong-willed musical prodigy, into returning with him in order to restore immortality to his dying kingdom. Their destinies are bound together, but their personalities often clash. Finding themselves working together to fight evil from the Underworld, they discover a mutual talent for music, realize common family issues, and experience a growing and changing relationship. From car chases, family dynamics, near-death experiences, and lethal Underworld creatures, to war between the gods, and prophesies, Haden and Daphne struggle to rewrite their destinies and change the fate of two worlds. Readers, who enjoy heroes, quests, mythology, adventure, mystery, and cliff-hanging endings, will love this first book in a planned trilogy. "Can u pick up milk on ur way home?" For sixteen-year-old Kari Andrews, junior at Kennedy Preparatory School in Washington, DC, this is an emergency text—a Code Black warning from her father. Shedding her school uniform for a Goth disguise and picking up her seven-year-old brother, Kari enlists the help of a few friends (makeup artist, computer whiz, and judo expert) to locate her missing parents, declared double agents working for the Russians. Escaping Agency thugs, breaking into CIA headquarters to rescue her mother, discerning friends from enemies, and trying to impress a longtime crush, Kari is determined to exonerate her parents from all false charges. But, are they false? 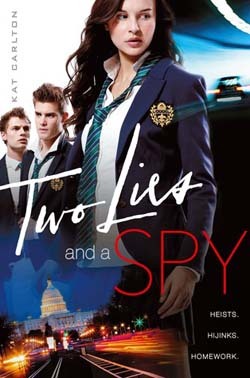 Engaging characters, plot twists and a surprise ending make for a wild and fun teenage ride through espionage territory.